On October 11, 2000, George W. Bush said, "I don't think our troops ought to be used for what's called nation-building. I think our troops ought to be used to fight and win a war." Regarding the war in Iraq, George Bush has gone from one end of the spectrum to the other. From an aggressive gang busters shock and awe attack on the Iraqi Republican Guard, to the other end of fear of being accused of injuring or killing so-called Islamic innocents. Even to the point of giving credence to an enemy whose Nation of Islam murdered more that 3000 innocent Americans, in the charging of our own soldiers with murder while fighting a war, this is incredible! Moreover, we seldom hear anything about Afghanistan; it is, as if we are not even there. In January 2003, President Bush was presented with two post-invasion plans for Iraq. One, authored by the Defense Department, called for a hard and fast invasion, using overwhelming odds to win the war, then the establishment of a provisional government in Baghdad, and an exit from Iraq in a very few months, to enable our forces to deal with the neighboring state sponsors of terrorism, Iran and Syria. The other, authored by the State Department and the CIA, was for the extended occupation and nation building in Iraq. Either way we should have finished winning the war before setting up any kind of a government. In between, 9-11 and today, was George Bush's conversion to the compromising politically correct "strategy" in fighting a war? According to Sun Tzu and his philosophy in the Art of War, when fighting a war, one must remain on the offence position. Shortly after rolling into Baghdad for some unknown reason, we stopped fighting the war; we went on the defensive and have been there ever since, attempting to create a new government before we win the war. In April 2002, Jed Baddin of the American Spectator wrote that the president's thinking was dangerously garbled, and that our British allies were very uneasy about it. In September, he wrote that the president needed -- before we took military action against Iraq -- to make very clear that Iraq was only part of the problem and that a war president was obligated to lead us and the free world to defeat the enemy in its entirety. However, between October 2000 and January 2003, President Bush became a neocon, meaning in this case, a new kind of conservative. 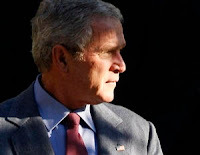 Since the fall of Baghdad in April 2003, President Bush has focused our war effort not on winning the war, but on building a new democracy in Iraq. We have not been either decisive or forceful with Iran or Syria. Last week, the President invoked the memory of Vietnam as the reason we should not abandon Iraq before the job is done. However, his definition of the job, is incorrect, and so is the lesson he learned from Vietnam. The debate about Iraq is essential, but is focused on the wrong issues. The question is not how best to withdraw from Iraq. The issue is how to win the war against the terrorist nations. Do you remember—If you harbor terrorists you are our enemy, you are either for us or against us? Gen. Petraeus is operating the surge magnificently, and it may -- by March or April -- have established I hope a sustainable success against the terrorists. At the same time, the Maliki government is -- as the new National Intelligence Estimate says -- dysfunctional and not able to govern. The President has said our goal in Iraq is to create a nation that can defend and govern itself and will be an ally in the war on terror. That definition of our endgame puts America on the strategic defensive. We did not go to war with Iraq because it was lacking the democratic philosophy. If that was our motive for war, we would be at war with more than two thirds of the nations of the world. We went to war because -- relying on all the intelligence we had -- the President in good faith judged Iraq to be a clear and present danger to the United States. Our forces swept through Iraq and entered Baghdad in a combat crouch, very aware of the equal -- or bigger -- threats posed by Iraq's neighbors. And there we stopped, as the anti-war, anti-Americans wanted us to, spending soldiers' lives to build a democracy in Iraq before the war was clearly over. Let's be very clear: whether Iraq becomes a democracy is not determinative of our success or defeat in this war. Iraq is only one campaign in the war against the nations that sponsor terrorism. Victory is not an Iraq that can defend and govern itself; it is the defeat of a terrorist regime. Victory is defined as the end of state sponsorship of Islamic terrorism, which means forcing Iran, Syria, Saudi Arabia and others out of that business. Nothing more is needed and nothing less will defeat an existential threat to America. Conservatives -- people such as you and me, and most of our military leaders -- believe that the lesson of Vietnam is not how to manage our withdrawal of Iraq. Wars, as Churchill said about Dunkirk, are not won by evacuations. Those who believe we have a moral obligation to defend defenseless Iraqis have a point. However, that point ended when Nouri al-Maliki said that if America abandoned Iraq, he could "find friends elsewhere.” The Maliki government is much too closely tied with Iran, and the only visible replacement for Maliki -- Iyad Allawi -- is tied as closely to Saudi Arabia as Maliki is to Iran. Neither of those nations is going to allow Iraq to be an ally in the larger war. We who lived through the Vietnam era understand that the lesson of Vietnam is not that we have to win the "hearts and minds" of the peoples of the Middle East. We know it isn't that we cannot pull out of Iraq prematurely. We know that we can be in Iraq for another sixty days or another sixty years and the situation will not improve especially while Iraq's neighbors continue to operate, fund, and arm the terrorists. The lesson of Vietnam is much different from the one the President apprehends. The lesson is the same as in all wars: if you fail to fight a war in a manner calculated to win it decisively, you will lose it inevitably. By waiting for the Iraqis to establish democracy and failing to deal with the terrorist nations that surround them, we have enabled our enemies to control the pace and direction of the war. It is time for the President to "Trump" the left and tell them they are fired, and then get on with the business of fighting a war that will end the threat to America. General Petraeus is literally working wonders in Iraq even though his military hands are tied by multiculturalism and political correctness. When he reported to Congress recently he said that the counter-insurgency is working, but hasn't yet succeeded. And he said that it needs to continue, as the President has planned, at least through March of 2008. Nevertheless, Senator Clinton said that she didn’t believe a word the General said. Now is not a time to second-guess Petraeus. Now is the time to tell Maliki and the Iraqis that our effort in Iraq is divorced from theirs. We as conservatives understand that Islamic terrorism cannot threaten us significantly without the support of nations. We are impatient with Mr. Bush's neo-Wilsonianism because it allows the enemy and its apologists to control the pace and direction of the war. We are unwilling to allow the prosecution of this war against the terrorist nations to be delayed for however long it takes Iraqis to sort themselves out. It is impossible for them to do so while neighboring nations -- Syria, Iran, and Saudi Arabia -- actively interfere. Conservatives do not want to be caught in the web of failed nostrums of Vietnam. We cannot wait for Islam to be reformed or to win the hearts and minds of the mullahs in Tehran. Fire these do-gooder anti-war America haters Mr. President, and reject their theories. Turn your thinking back to October 2000. Order Gen. Petraeus to do whatever is necessary to win this war now in Iraq, so we can turn our military and intelligence establishments' attention to the nations that surround it. Stop thinking about how to not lose. Think about how to win, or we will have another Vietnam.